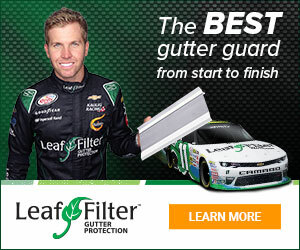 I had been researching gutter protection for awhile and then ran across Leaf Filter. We had Scott G come out and give us his presentation. He even brought along 3 competitor products that they had taken off others gutters to replace with LF. The mini water demo at the kitchen sink with LF and other guards was amazing! Watch carefully when the salesperson you have come over, does the paper towel pieces test. You won't believe what happens. Scott was very personable and there was no high pressure. We chose to have LF installed and it was done the next day. As I'm writing this, it is a torrential downpour and there is absolutely no run off over the gutters edge as it would do if the gutters and downspout were plugged. Scott told us during his presentation, "If there are no openings, nothing gets in!" Keep this in mind when you are looking at other gutter guard systems. They all have openings. We would highly recommend doing business with LF and the cost is less than other systems out there!!! Review #1067565 is a subjective opinion of testimonial.